The wood behind the bar and brick in the front are new, but are made to mimic the native infrastructure. Custom light fixtures are a collaboration between the owners and architect. 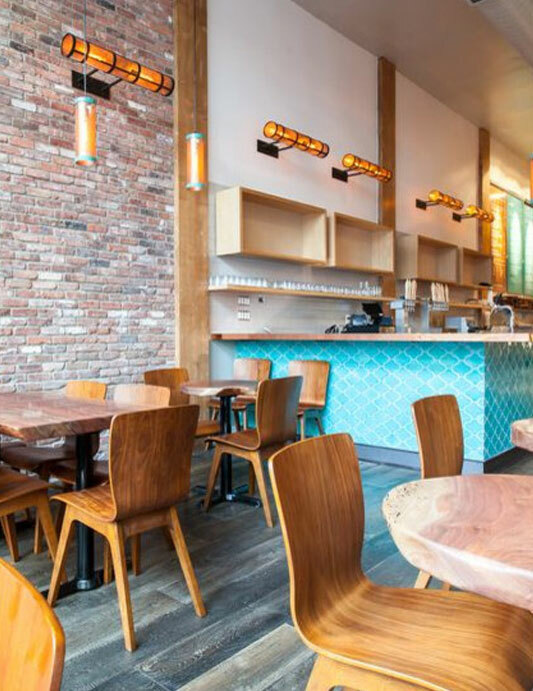 The owners turned to Fireclay Tile for the vibrant turquoise Moroccan tiles featured on the bar, a nice change of pace to the Heath subway tile that has become so trendy. The reclaimed wood tables, liquor library, wine shelves, and bar—in addition to the copper-top standing bar at the bottle shop—are all custom made by Menlo Hardwoods.